New to the Varian Arabians Blog? To READ blog posts and comments, no action necessary. To POST comments, you must be registered. Click "Register Now" above to join. To SUBSCRIBE to specific bloggers and receive notifications on new posts, click the "mail" icon in the toolbar above the blog (registration required). In that time between sleeping and waking I see Sheila and I in her big arena on a beautiful fall day. Mostly she is just riding her horse, enjoying the bliss, the dance that is her and her Jubilation. When she looks up and happens to see me doing something that she doesn't' like, she corrects me, as if it disrupts her dance. I focus, try to emulate….. Oh my. Sheila marveled in the beauty of the Arabian horse and it's abilities. Her first "Aha" moment with a horse, though, happened when she got up on Syd Spencer's bridlehorse "It was like cutting butter with a hot knife," is what she'd said. She wanted that in her horses. She loved the beautiful gear, the rich tradition, but mostly she loved the feel of it, the artistry, of a true California Bridlehorse. I'd met Jeff Derby at the V6 Ranch a few years back. Since then, he'd gotten together with Bruce Sandifer and the two of them have been reading, researching, applying the techniques of the Traditional California Bridlehorse, (very similar to what Syd taught to Sheila), and in the last number of years, have been putting on workshops for interested horsemen. My cousin, Rachelle, was hosting them in Grass Valley the end of September, right when I would be driving south with the horses. How about that? Since I am on a real quest for knowledge, and I respected what I'd seen in Jeff, and I knew of Bruce's reputation, and I love my cousin Rachelle, I signed right up. Friday morning, Bruce helped me fit my hackamore to Arizona, and into the arena we went. The atmosphere was a bit over the top for him. There was a giant paint mule and a couple of quite energetic horses in that big grand arena (the location was breathtakingly beautiful). Jeff offered to do a little ground work with him, then he got on and rode him around a bit before giving him back to me. We did our best the rest of the morning, trying to put together what we were supposed to be doing and keeping all four feet on the ground. There were a few moments however, when my brakes, steering and transmission all went out from under me, so at lunchtime I decided to switch horses. With Roy it was an entirely new ballgame. As I fumbled through the signals, it was easy to see when I did something correctly, (a moment of cutting butter with a hot knife) and when I did it wrong. The method is not only about the hackamore, two rein, and spade bit, but also about balance, signal, response, support. There was a lot to work on. Toward the end of the day, Bruce got on Lego, his young Azteca gelding, and rode as if he were just at home working his horse. The dance was on. I realized that his balance was very similar to Sheila's. His horse danced much like Sheila's horse danced. I had to look away, it was achingly beautiful. Day two began with Bruce and Jeff doing a talk, explaining the history, the beauty and functionality of the gear, the signal and response of riding this way, and the psychology of the horse. They brought out "Skully," a horse's skull, and showed us how different bits work in a horse's mouth. Pretty smart to give this talk on day two, after we'd had a day to build up some questions. After lunch all I could really accomplish with Arizona, was to get him (with Bruce's help) to walk, keeping his focus with me, around the arena and the other horses. I believe he is a smart and brave horse, he's just young and this was a lot for him. I got back on Roy when they brought in the cattle to play with. At the beginning of the third day, I did what I should have done on the first day. I ponied Arizona around with the other horses in the arena. He was pretty animated, but being at Roy's side surely helped. I put him away then, and with Roy, played with the cattle, did a little roping. I thought only little kids could have this much fun. My cousin Rachelle was riding her horse, Nordico, a four year old black PRE gelding that she bought from Jeff. In the evenings, through weary eyes, over dinner, we would tell stories and laugh before climbing into our beds. Rachelle and I are of early California blood. That's part of the lure that drew her, and intrigues me, to this method of horsemanship. Riding there in our hackamores, especially as we gathered the cattle from the golden hillsides studded with live oaks, I could almost see our great great grandfather, Augustin Janssens, riding along between us, a quiet smile on his face. You will immediately feel a bonded connection to Lisa's stories. Like Sheila, she has the gift of bringing a story to life on a page with her soft, candid and vivid writing style. It was this style that perhaps led her to becoming much of Sheila's voice over the last year with heartfelt updates enjoyed by thousands around the world. 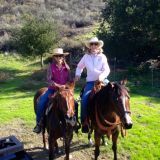 Sheila and Lisa shared hours in the saddle together riding out on ranches across the country. 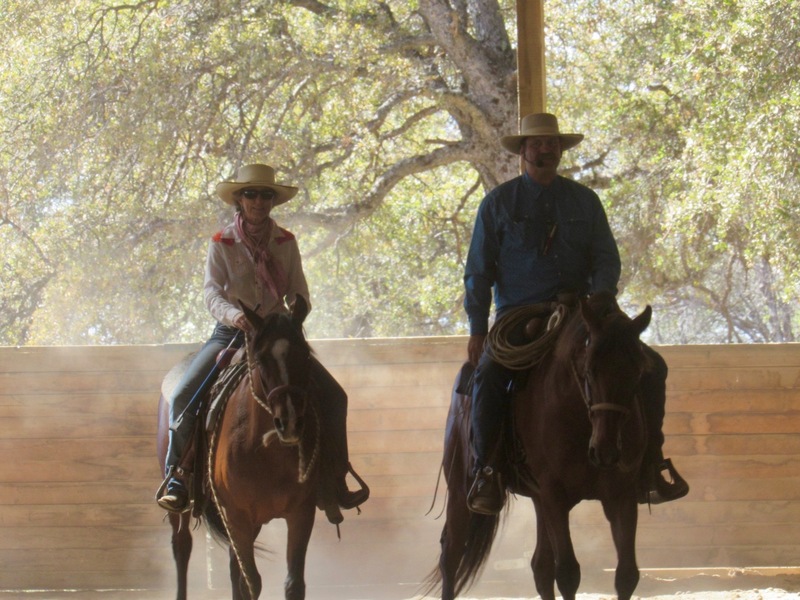 A truly gifted horsewoman with an equal amount of heart, you'll love her blog where you'll often laugh, sometimes cry, but always learn a thing or do about the journeying cowgirl life.